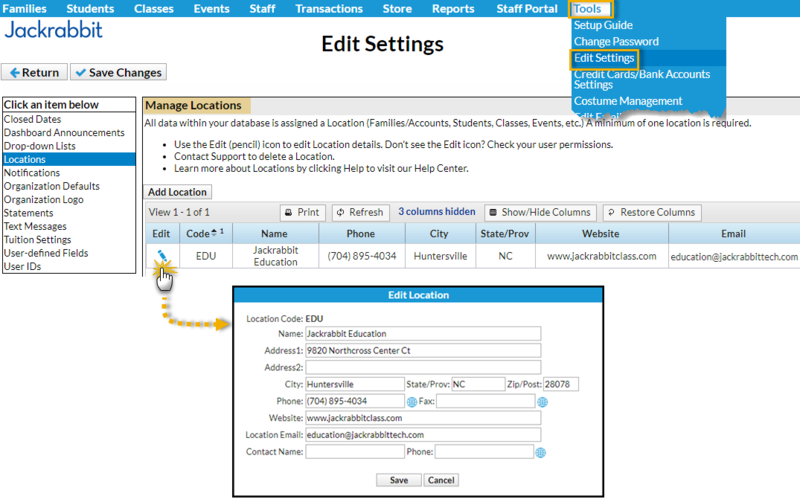 Address settings for your organization are edited from the Tools menu > Edit Settings. From the Tools menu, Edit Settings opens to the Organization Defaults. Enter your organization's address information here. Immediately below this section are the Registration Form Defaults that affect both your Quick Registration and your Web (Online) Registration forms. Entering a default city, state/province, zip/postal code, and/or area code saves time when adding new families and students. These fields will be pre-filled on Jackrabbit's registration forms. Note: Pre-filled fields can be changed on the registration form as needed. Enter city, state, zip and area code defaults. This is optional and you can skip this if your organization spans several cities, zips, etc. For now, leave Allow Portal Access for 2nd Contact set to Yes. When you are ready to dive a bit deeper you can learn more about this in our Parent Portal help articles. Address information is also required for each of your Jackrabbit Locations. From Tools > Edit Settings select Locations. Click the pencil icon to add or edit the address information.